Home › Ask the Vet › Transitioning from Pasture: What are the Risks? Transitioning from Pasture: What are the Risks? I have just moved my horse from Missouri to Oklahoma. He is going from full time, lush pasture that received a great deal of rain to turn out with occasional grain (a scoop 2-3 times per week). Now he is in a stall with 1/2 grain and full hay, with a daily turn-out from 9-3. However, there is almost no grass in this field due to drought. I have been hand grazing him for an hour to 1/2 hour per day to ensure that he gets at least some grass in his diet. When is it safe for his system (to prevent founder/colic/etc) to transition to full grain and for me to discontinue hand grazing? I like the fact that your horse is still getting six hours of turnout! But to me, transitioning to full grain and discontinuing grazing are two completely different things. That is, adding grain to your horse’s diet is not making up for the loss of fresh pasture, in fact, it’s making it worse. That’s because green grass has what we think is the ideal ratio of omega 3 fatty acids to omega 6 fatty acids, about four to one (4:1). On the other hand, grains like oats and corn have inverted this ratio to between one and twenty or thirty (1:20 or 1:30). That puts your horse in a chronic state of inflammation because, while necessary to the body, omega 6 fatty acids are considered “pro” inflammatory and too many tip the balance towards excessive inflammatory molecules. So while it’s unfortunate that you had to move your horse to a barn with no pasture, you can help make up for this by continuing to handgraze him each day. Think of it as your “bonding” time with your horse. Another option is adding back in omega 3 fatty acids separately—from sources like flax seed, chia seed or fish oil–so that the ratio is not skewed. Now to the grain issue. First decide if your horse even needs grain in the first place. Is he in hard work or on the thin side and therefore needs the extra calories for energy or weight gain? If so, then perhaps adding grain to his diet is the right choice or adding hay, beet pulp, fat or another source of calories is a more appropriate solution. Next, decide how you want to meet your horse’s vitamin and mineral requirements, which is the other reason most people feed grain. It’s not clear in your question if you mean whole cereal grain (like oats or corn) or commercial fortified grain (like pellets or sweet feed). There’s a big difference in these two options when it comes to completing and balancing the diet. Commercial grains have been fortified with vitamins, minerals and other nutrients to meet the horse’s minimum requirements IF the full amount of grain recommended on the bag is fed. For example, if you’re feeding a product that says to give six pounds a day based on your horse’s age, weight and workload but you’re only feeding three pounds a day, then you’re cutting his vitamins and minerals in half. He should also receive at least half a serving of a multi-vitamin/mineral added to his daily ration. Horses that receive little to no grain (such as a handful to mix in supplements) should get a full serving of a multi-vitamin. One thing you didn’t specifically ask about was his hay. 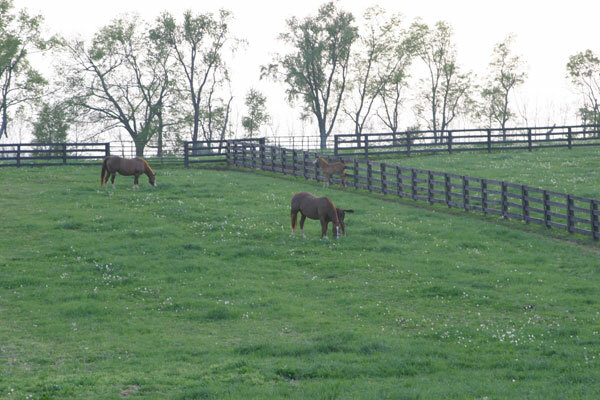 Studies have shown that a change in hay is a greater risk factor for colic and founder than a change in grain. Why? Hay is digested by the microorganisms (good bugs) in the horse’s large intestine and an alteration in their regular diet can lead to large numbers dying off and releasing toxic substances. At the same time, populations of “bad bugs” take advantage of the situation and increase in number. They ferment the fiber in hay to substances like lactic acid. Fortunately there are some products specifically designed to ease this transition period that contain Saccharomyces cerevisae yeast and others that contain prebiotics, probiotics, digestive enzymes, oat beta glucan or other ingredients to help maintain a normal, health digestive tract. Whatever changes you decide to make, be sure to make them all gradually (say over a two-week time period). This will help reduce your horse’s risk of major GI disturbances and their serious consequences. Putting your horse on a restricted free feed diet of grass by using a small mesh hay net will keep his system at the same homeostasis as he was out in 24/7 pasture grass. But instead, he’ll be “grazing” on a low calorie grass hay available to him 24/7 in a hay net, getting all the digestive benefits but without being out on pasture. I use the Freedom Feeder nets for my horses. They are the lowest cost with the most capacity that actually work that I have found. I have one of each of the three sizes so no matter what the situation is, my horse will always have his net to graze on. But for at the barn I use the bale size and only have to refill it every 5day days! !